When World War II began in September 1939, there were approximately 1.6 million Jewish children living in the territories that the German armies or their allies would occupy. By war’s end, over 1 million of them, and perhaps as many as 1.5 million, were dead — targeted victims of the Nazis’ calculated program of genocide. All Jews were targeted for death, but the mortality rate for children was especially high. Only 6 to 11% of Europe’s prewar Jewish population of children survived as compared with 33% of the adults. The young generally were not considered useful for forced labor, and the Nazis often carried out “children’s actions” to reduce the number of “useless eaters” in the ghettos. In the death camps, children, the elderly, and pregnant women routinely were sent to the gas chambers immediately after arrival. Among the small number of European Jewish children still alive at the end of the Holocaust, thousands had survived because they were hidden. With identities disguised, and often physically concealed from the outside world, these youngsters faced constant fear, dilemmas, and danger. Saved from certain death, these children nonetheless bore the scars of the trauma they endured during the war. They often had to confront fundamental questions of identity after the war. In many cases, non-Jewish aid organizations and Catholic families tried to convert the children in their charge. Even when this did not happen, the children naturally felt affection for the adults who protected them, and some felt torn at the end of the war, even when they were lucky enough to reunite with their families — of whom they sometimes had only a distant memory. 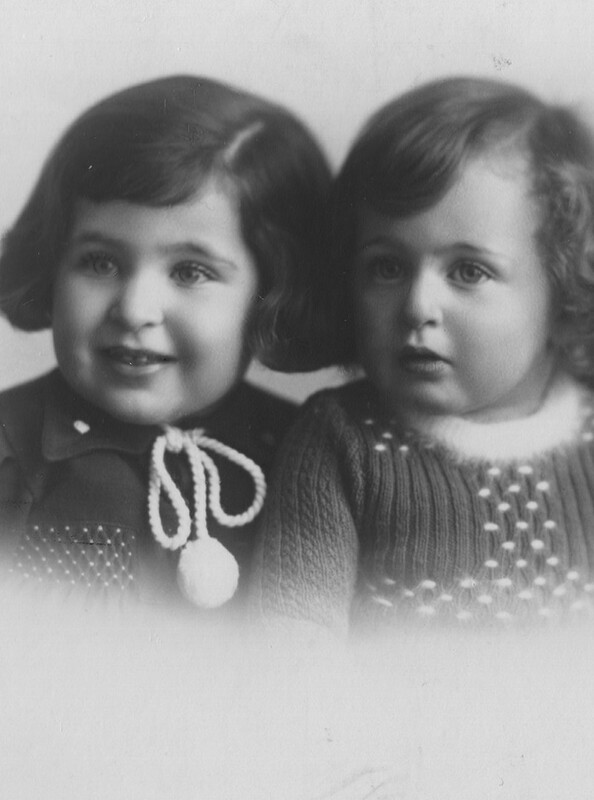 The following five excerpts from the memoirs of Canadian authors published in the Azrieli Series of Holocaust Survivor Memoirs testify to the singularly challenging situations lived by hidden children. 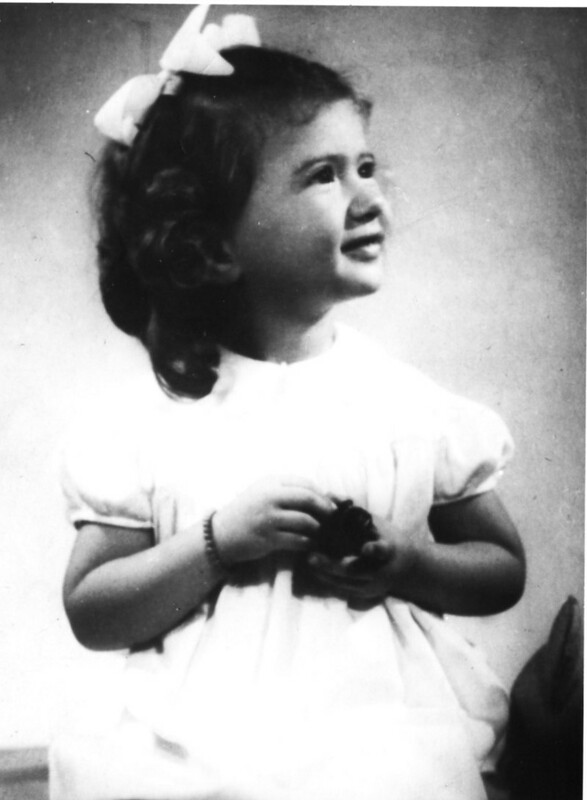 Judy Grünfeld Abrams at three years old. Budapest, 1940. My mother and I both carried light coats draped over our arms. It was quite warm for April, not unusual to want to walk coatless in the sun. Those who saw us would not guess that this was a dangerous thing to do. The coats, so casually turned inside out, bore the compulsory yellow cloth Star of David sewn onto all our outer clothing, branding us Jews. “Why should I hide the star? I’m proud to be Jewish,” I had announced, ignorant of the ominous implications of being seen in the street with the telltale star. Usually, I was obedient and my occasional bouts of verbal bravado simply reinforced the admiration of the adults around me. I was the precocious, much-cherished child of well-to-do parents. How had my parents impressed upon me the importance of denying my identity, the need to maintain that I was a Christian girl called Ilona Papp, not the Jewish Judit Grünfeld? I had always liked to play make-believe, but somehow they made me understand that this game was real. I never gave away my secret. In fact, I wanted so desperately to believe that I was this other, more desirable child, that I don’t recall longing for my parents. Eventually I believed that they and the past we had shared were objectionable, shameful and even worse, a sin. Folding my coat inside out was just the first step down this road. 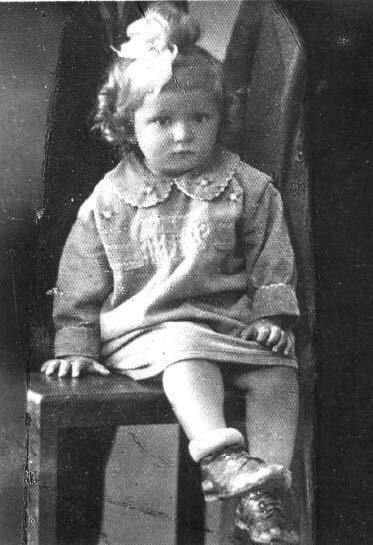 Rachel, in 1936 (photo found in Velvel’s violin case). 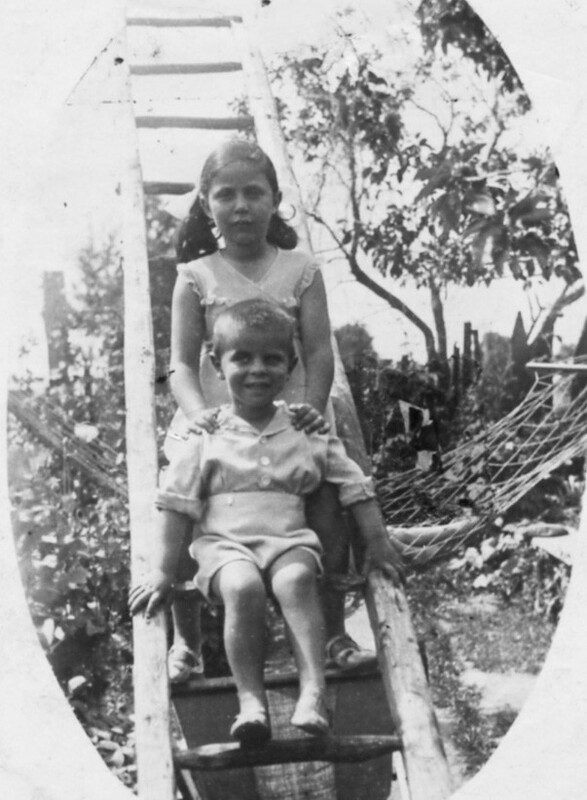 Arthur and Eugenia, Poland, c. 1933. At the beginning of the summer, we wore cut-off pants in the water, but later, when the boys started swimming naked, I had two problems. The first was that I didn’t know how to swim and the second was, of course, that I was worried about letting the other boys see me naked [Ed. Note: due to being circumcised]. I told them that I was from a very religious family, that it was against my beliefs to appear naked even in front of males, but that I would go in wearing my underpants. I also told them that I was willing to take swimming lessons from anyone who wanted to teach me. My explanation seemed to satisfy the boys. Although I was out of danger for the moment, I knew that this would not be the end of the story. 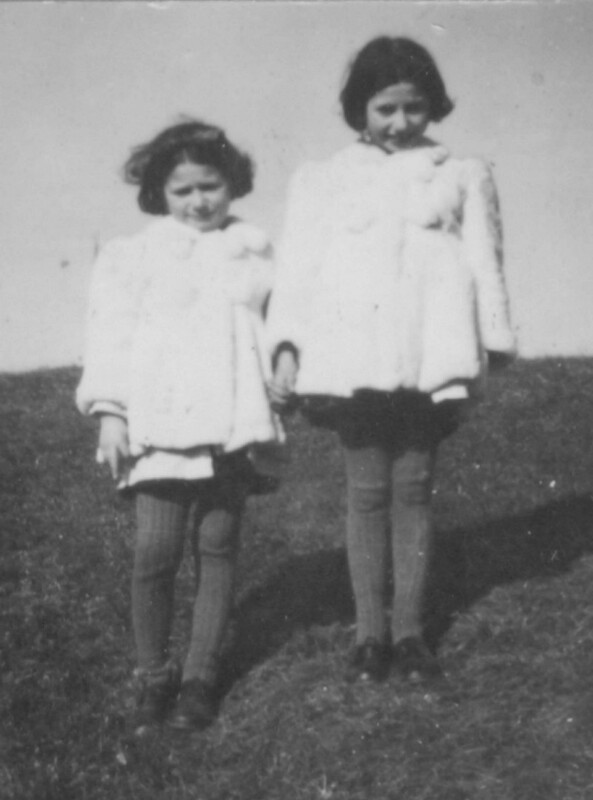 Marguerite (left) and her sister, Henriette, wearing their rabbit skin fur coats on the mountain at Vatilieu during their time with the Chatenay family. Circa 1943. “Are you ready, girls?” asks Mama tearfully from the kitchen. She hasn’t stopped wailing and shouting. Now, she opens the sideboard and takes out some crystal glasses. She throws them against the wall we share with the neighbours, saying something I don’t understand. Crash, bang! The neighbour answers by knocking on the wall with her crutch, once, twice, three times. “Stop it, Mama! Stop!” begs my sister. Everything is so painful right now. A little bit further and we’re there. “Here’s your new home,” says Colette Morel. My head is itching. I see cows and horses. I can smell manure from the stable. We are introduced to the farmers, the Chatenays. Our guide is in a hurry. She hands them our suitcase, says goodbye to us and leaves. After a delicious snack — I still have my eye on the cake that’s left — she shows us around. They have a grocery store. I see blocks of butter, cream cheese, barrels of wine, and several kinds of bread and milk. I won’t die of hunger. We go upstairs and Madame Chatenay shows us our room. My sister and I will sleep together in the double bed, under the crucifix on the wall. “Careful not to dirty my bedspread,” she says with a scowl, noticing traces of earth. It is difficult to write about what it felt like, not being with our parents for so many years. Our life was certainly far from normal. Although we did not suffer any physical pain, having to hide throughout three years of our childhood was emotionally painful and lonely. I was born in January 1936, and my sister, Olga, was born in December 1937, in Rotterdam. She was only two, and I four, at the outbreak of the war in the Netherlands. Before we left, we were given strict instructions never to talk to strangers. We were to act as nieces of our new family and we would be brought up as Christians. We were to tell anyone who asked that Mam was in the hospital and that Pap was working in Germany. It was a very believable alibi, a fabrication we would be forced to tell in order to survive. No one was ever to know that we were Jewish. A bedroom in our new home. 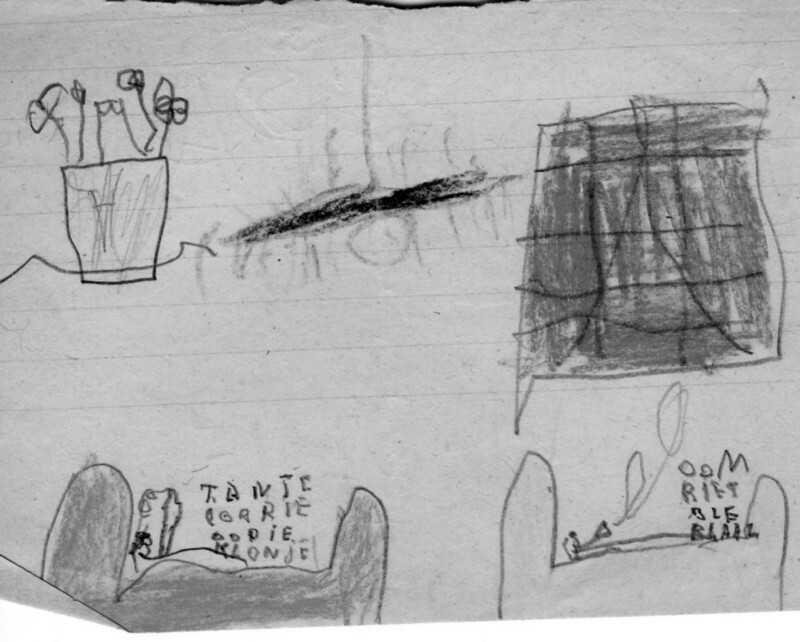 By Claire Baum, age six. When we came home, I noticed Tante Kor picked something up from her doorstep. I thought that it looked like the yellow Star of David. I was scared. Had it been left there for me? I knew I was supposed to have worn it when I turned six years old but of course Mam and Pap would never have given it to me then; and of course would never have let me wear it. Tante Kor thought about who could have left it on her doorstep. One of her neighbours? Peter’s father, who was a member of the NSB Party? She knew that it was for me to wear — Ollie was too young. When I went to bed, Tante Kor showed it to me. She told me not to worry and that I did not have to wear it. She emphasized that I was “a Christian now” and Christian people didn’t have to wear the yellow star. The Nazis had made a mistake, she said, she was going to throw it out. Before she did, she asked Oom Piet what he thought she should do. He insisted that she destroy the evidence. She threw it in the fireplace and burned it. We were happy; we were safe, for now. No one would find out anything about us! We thought that Peter, who lived next door, was our friend, although he always asked too many questions. It turned out that he didn’t believe that we were nieces of the Duchenes and his suspicions must have led him to assume that we were Jewish. Peter belonged to the Nazi Party for young boys, called the Nationale Jeugdstorm, and was anxious to betray us so that he would be considered a hero by the Party. He had approached his dad about his suspicions. 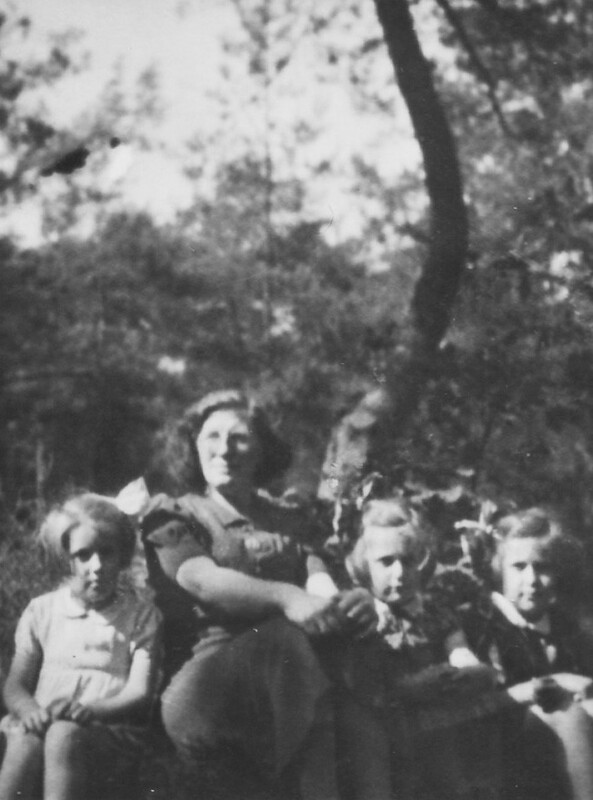 Claire (far right) and Ollie, beside her, with Jopie and Tante Kor, the first family they were in hiding with during the war. Soestduinen, 1942. We were lucky that Peter’s dad felt sorry not only for us, but also for the Duchene family. He realized that all of our lives were in danger and knew that we would be arrested by one of his NSB Party friends. First, he scolded his son and told him that he was wrong, we were family, and to forget it at once. He knew very well, however, that his son was not wrong. That very night, he went to see Tante Kor and Oom Piet and begged them to take us away immediately. He felt that it was his duty to warn his neighbour. When it got dark, Tante Kor and Oom Piet took us on their bikes back to the train station where Oom Pauw, our Resistance worker, was waiting for us. We were lucky — we had escaped! Preserving & publishing the memoirs of Canadian Holocaust survivors to promote Holocaust education and break down models of intolerance and exclusion.